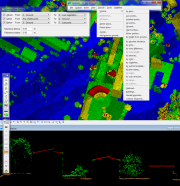 TerraScan is the main application in the Terrasolid Software family for managing and processing LiDAR point clouds. It offers import and project structuring tools for handling the large amount of points of a laser scanning campaign as well as the corresponding trajectory information. Various classification routines enable the automatic filtering of the point cloud. The results from the automatic classification can be refined by using half-automatic and manual classification tools in combination with versatile 3D point cloud visualization options. Most of the automatic classification routines can be combined in macros for batch processing. In combination with TerraSlave macros can be executed outside TerraScan and MicroStation, even on other workstations over a LAN. TerraScan supports several import and export formats, including the LAS format, TerraScan Binary and TerraScan Fast Binary formats, as well as ASCII formats that can be defined according to the users' needs. 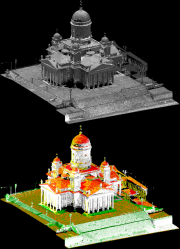 Point cloud management, processing and visualization is only one part of TerraScan. In addition, the software provides tools for creating 3D vector data based on the laser points. There is also the opportunity to produce 3D vector models of buildings (up to LOD2) automatically over large areas. Toolsets for checking and modifying the building models manually enable the creation of more accurate and higher-quality building models. For the application field of power line processing, TerraScan contains tools for the automatic vectorization of power line wires, manual placement of tower models as well as labeling, reporting and danger object analysis tools. TerraScan Lite is a lighter version of TerraScan for viewing laser points that are already automatically classified and for performing processing steps that require manual effort. TerraScan UAV is another lighter version of TerraScan. It is dedicated to users that process only point clouds collected by Unmanned Airborne Vehicles (UAVs, also called Drones). UAV systems produce relatively small point clouds from a low altitude. Therefore, the UAV version of TerraScan is recommended to be used for processing point clouds up to a few hundred million of points (depends also on hardware conditions). TerraScan UAV does not have any project capabilites. Tools and macro actions can be performed on points loaded in memory but not on project level. TerraScan UAV is available only in a bundle with other Terrasolid UAV software versions, such as TerraMatch UAV, TerraPhoto UAV, and/or TerraModeler UAV.